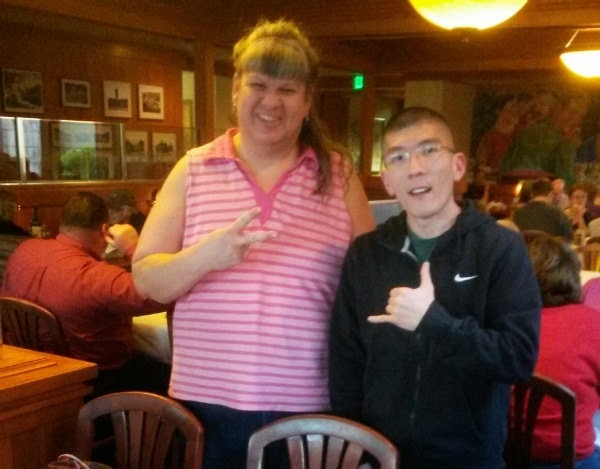 From late March to early April, competitive eater Stephanie Wu visited the Pacific Northwest, looking to add to her food challenge victory count. I joined her while she attempted three Portland-area challenges. 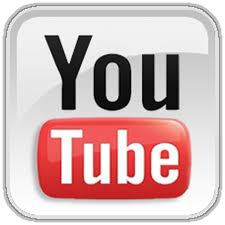 Stephanie is a soft-spoken and kind individual who videotaped her challenges in hopes of launching a website in the near future. I'm honestly looking forward to watching the other challenges she did in other parts of the United States. Before coming up to Portland, Stephanie had also conquered the 7-pound Lucky Seven Challenge at China Blue in Corvallis on March 27, winning the $1,500.00 jackpot. 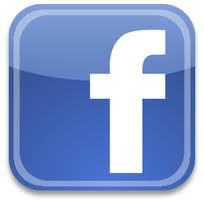 The jackpot starts at $100.00, then is increased by another $100.00 for each month the challenge goes unbeaten. Molly Schuyler had been the last person to defeat the challenge, nearly 15 months to the day. With the win, the jackpot resets to $100.00. 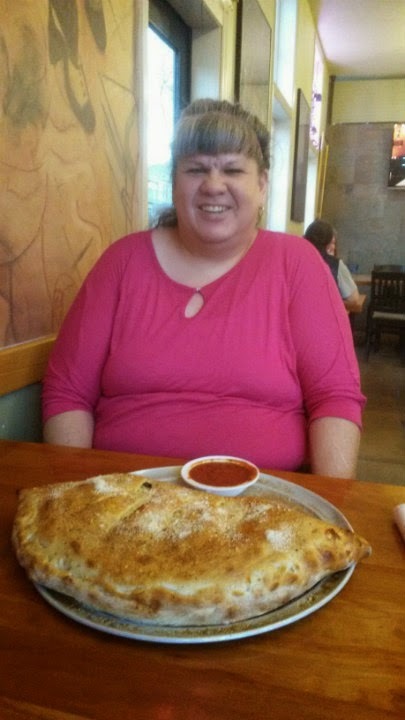 On March 28, I joined Stephanie at Opa Pizzaria in Portland (Sellwood neighborhood) as she tackled a calzone weighing in at approximately 5.5 pounds. 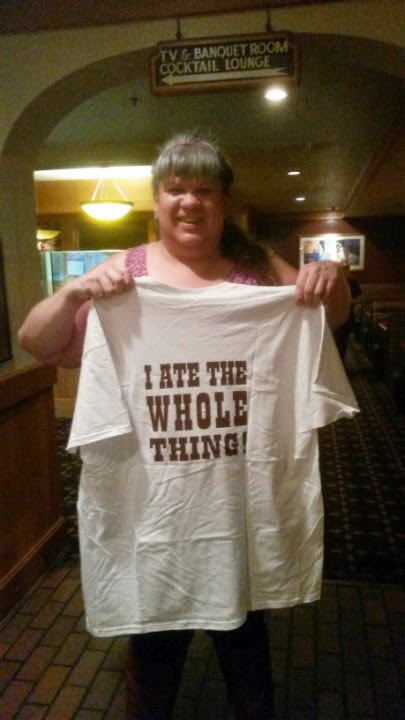 Just under 25 minutes into the 30-minute challenge, Stephanie emerged victorious, getting the meal free and a complementary T-shirt. She was the first female winner and the 12th winner overall. 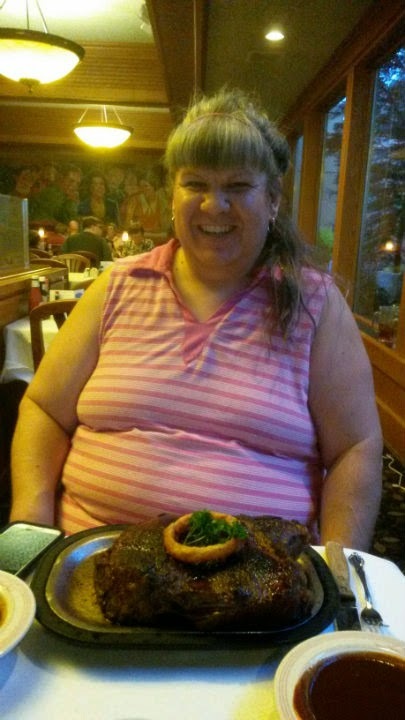 On March 30, Stephanie and I met up at Sayler's Old Country Kitchen in Portland as she took on their 72 oz. 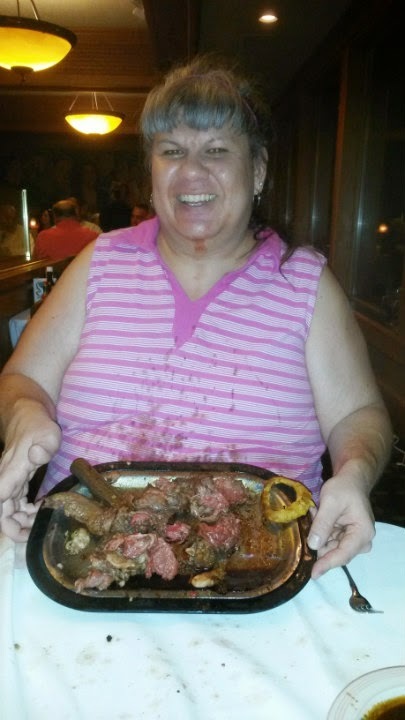 steak challenge (steak, sides, dessert, and a drink). While you have to also consume the sides, dessert, and drink, you can ask for all that before the steak arrives. 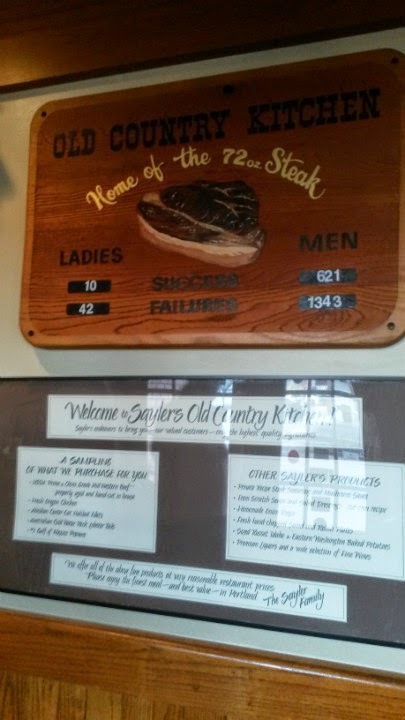 Only the steak has to be actually eaten in the one-hour time limit. 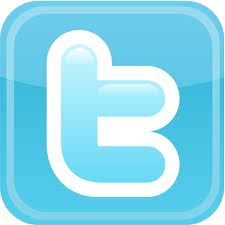 Winners get the $65.00 meal free, a free T-shirt, and the privilege of changing the "Winners" number in the main hall. 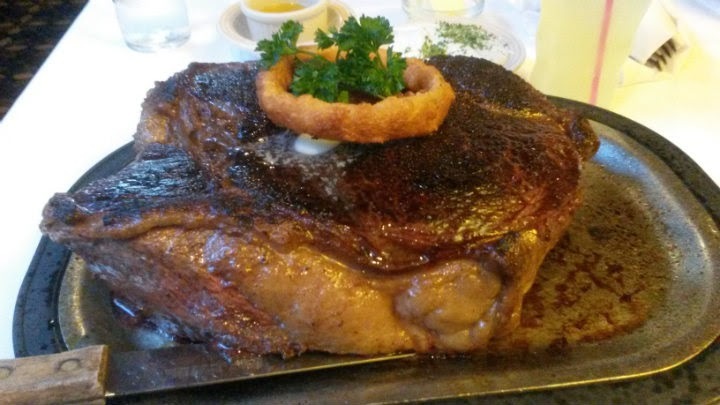 You don't have to eat the fat and gristle on the steak, but the manager has the final say on that. 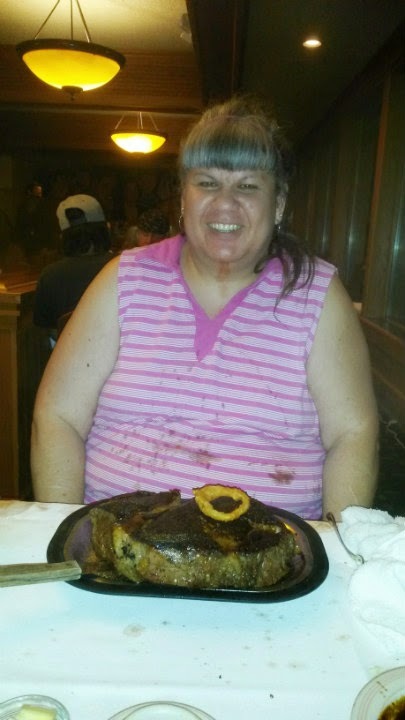 After eating the sides, dessert, and drink, Stephanie ate the 4.5-pound steak in just under 17 minutes. Considering I'd need a few days to finish that, watching this was nothing short of impressive. After a few minutes of contemplating, Stephanie opted to do a second 72 oz. steak challenge. 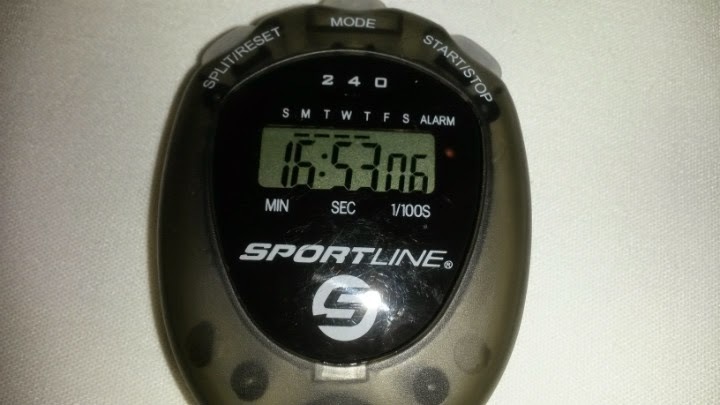 Another $65.00 was on the line. 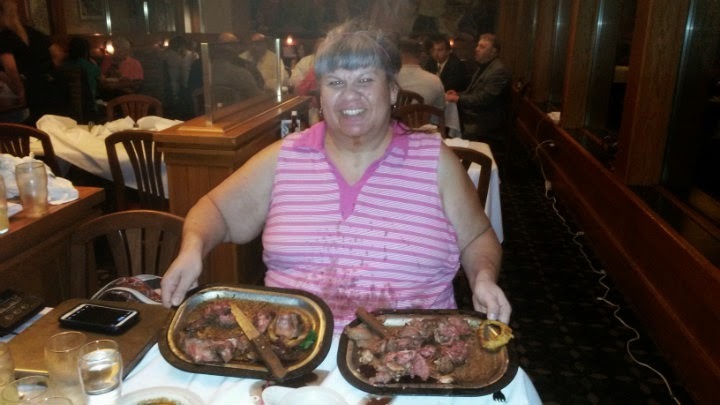 During the 40+ minutes needed to prepare the second steak, Stephanie took down the second set of sides and dessert. 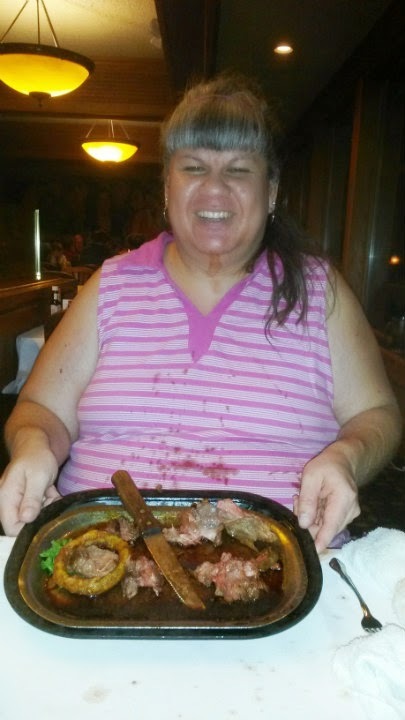 She expended roughly 56 minutes of the 1-hour limit for the second steak, but got it down to the manager's satisfaction. 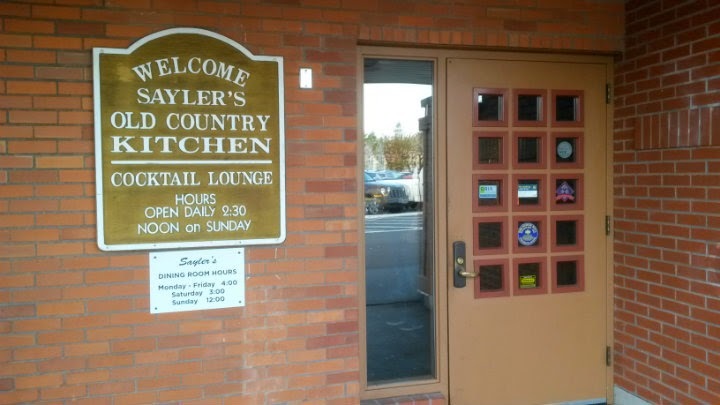 Sayler's announced the feat over the PA system, drawing applause from the patrons. 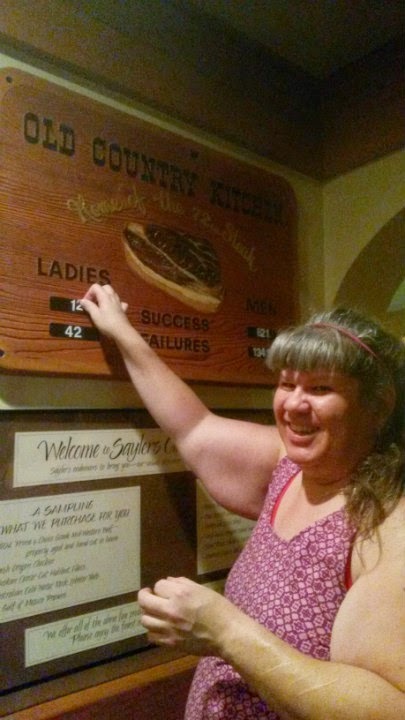 The restaurant staff declared this two separate victories for Stephanie, allowing her to change the number of female finishers from 10 to 12. 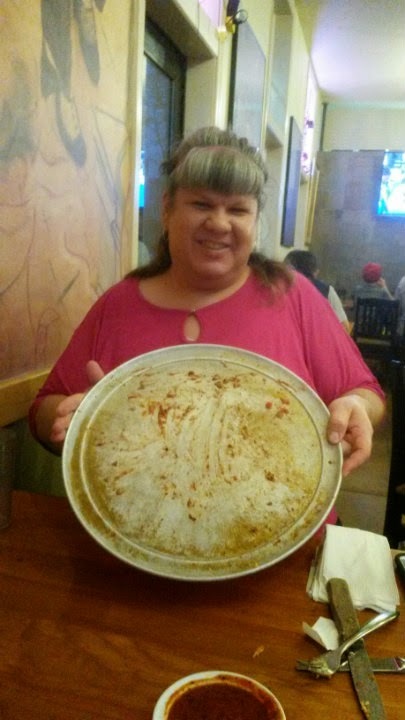 Nearly 15 months ago, I was at Sayler's to watch Molly Schuyler smash the world record for devouring a 72 oz. steak. Pretty cool that I was present for two impressive eating feats. 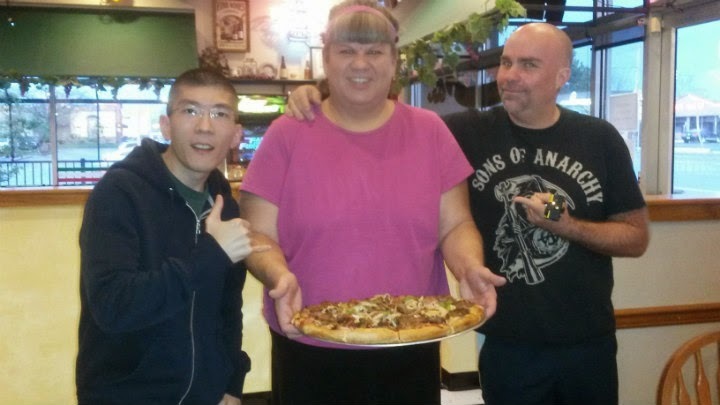 On April 1, we met up in Gresham at Flying Pie Pizzeria for their 16" Combo Supreme pizza challenge. 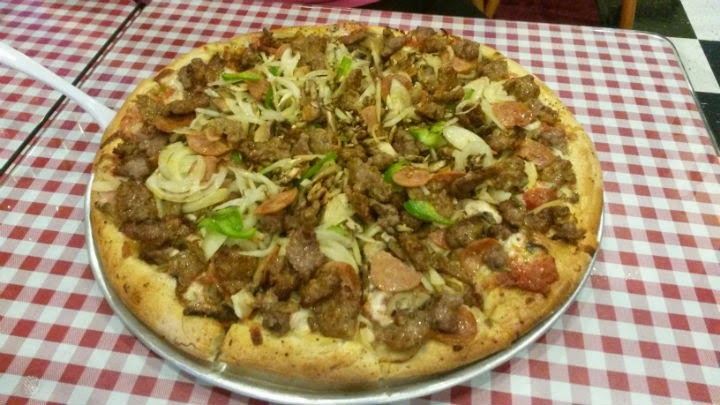 Although it's probably the size of a standard large or XL pizza, it is piled with toppings and clocks in at over 6 pounds. 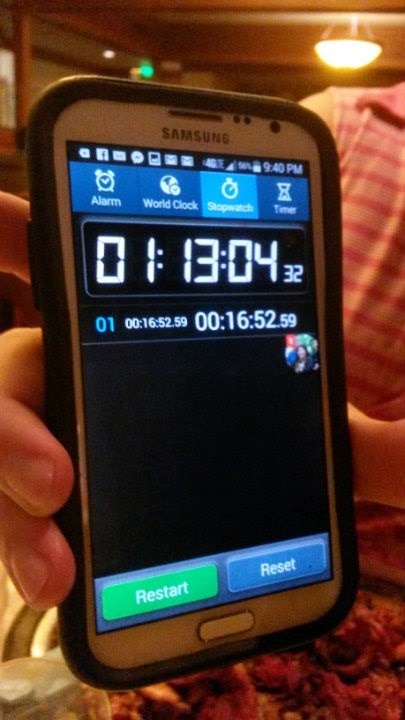 Challengers have one hour to finish. Winners get the $26.80 pizza free, plus a T-shirt and visor. It's an unadvertised challenge, so very few people have even heard that this challenge exists. 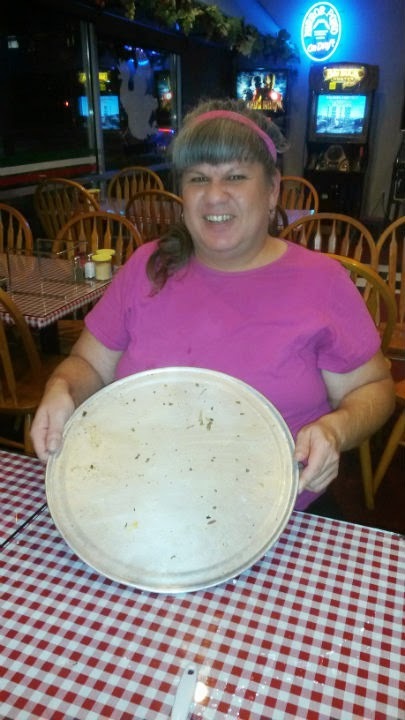 Only two or three other people I know of have finished this pizza. 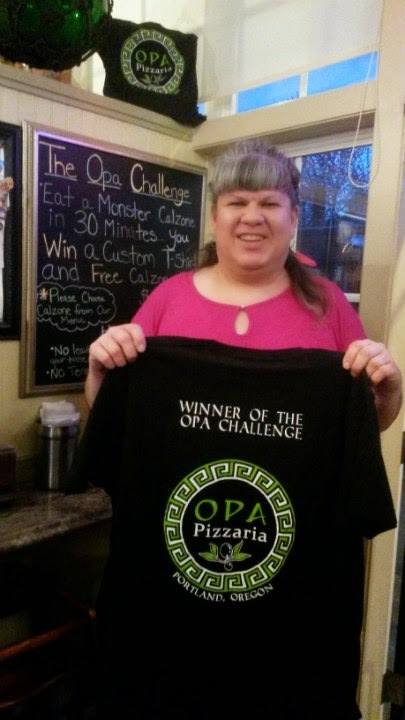 Stephanie scored her third victory in Portland and the surrounding area, finishing the pizza in about 45 minutes. I've had Flying Pie's pizza before (a smaller version, of course) and can confirm it's damn good. 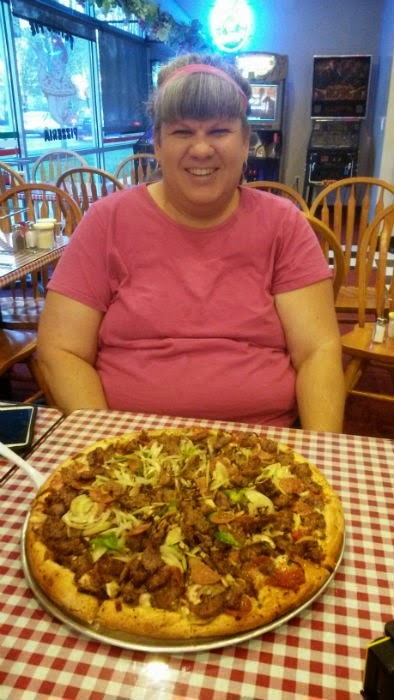 On April 3, Stephanie went up to Stuffy's in Longview, Washington, for their 7-pound breakfast challenge. Unfortunately, work prevented me from making the commute up, but I was told she also completed that with a couple minutes to spare. In the process, Stephanie added Washington to her list of states with at least one challenge win. It was fun to watch these challenges, especially since I didn't have to put my own body through any torture. 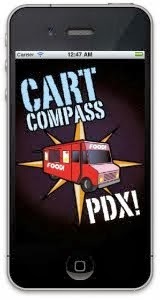 If any of my other competitive-eating friends come to the Portland area, please hit me up. At the very least, I'd be down to provide some support. Thank you so much for such a terrific article Aaron! I don't know what to say except I love it. I can tell you pour your heart into this blog! I know the write up probably took a while too. I am also sorry I am writing this so late...I've been traveling for much of the day, but this was the very first item I saw on my twitter feed this morning. Thank you for doing this! It was a thorough pleasure meeting you in person!